Suddenly torn from his family, 12-year-old Ahiram is sold as a slave in the Kingdom of Tanniin. Six years later, in order to win his freedom and return home, Ahiram enters the elite Games of the Mines. Pursued relentlessly by his enemies and driven to the limit of his endurance, Ahiram unwittingly awakens a dormant fury within him, and its resonance is caught by a hidden malice that turns the Games into a living nightmare. Refusing to submit to a cruel tyranny, Ahiram must face a harrowing death in the bowels of the earth. Still, a glimmer of hope remains. For deep within the mines, between stone and gold, a power - unlike anything the world has seen - quietly calls his name. What did you love best about Age of the Seer? I loved the world building in this fantasy. There was a lot imaginative creation and it told a good story. The characters are unique. I found it interesting. The mystery of the political intrigue and the plight of the slave was entertaining. I was curious how everything was going to tie up in the end. What does Richard Evert bring to the story that you wouldn’t experience if you just read the book? His character voices were intriguing and entertaining. For instance if I tried to read the dwarf speech, I'm not sure I would have understood it as well as he delivered. Overall well done. Would like to hear more with him narrating. No. it is very detailed oriented, and would have been far too much to read or listen to all in one sitting. I am curious to see where this series goes. The constant stumbling of the narrator made it a challenge to enjoy the book. I ended up just reading the book my self. 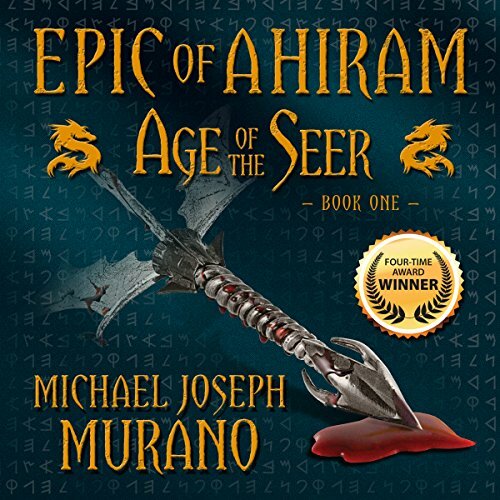 The Epic of Ahiram is a rich story of adventure, fate, and magic. The interconnectedness and vibrance of Ahiram's world and the fullness of its characters captivates readers pulling them all the way in. You won't be able to put it down. Do Not Buy As Audiobook. I know I'm going to sound petty, but I could not get 8 minutes into this book listening to the narrator. Didn't finish. Bought the text version and I will be giving that a go. Who would you have cast as narrator instead of Richard Evert? Almost anyone. He really ruined this one for me. His halting delivery, the voices he gave to the characters and what I felt was a dead-pan performance stopped me in my tracks. I could not get in to the book. I did not give it a chance. I deleted it. I bought the text version and I'm sure I'll enjoy it that way. Please do not waste money or a credit on the audio version. Buy the text version if you are going to give it a try.